What comes to your mind when you think of stretching? Most likely it’s images of skinny girls in yoga pants, not massive bodybuilders. But what you may not know is that applying deep weighted stretches to your routine can result in monstrous muscle growth and prevent plateaus. There are a number of complex cellular processes that take place and produce not only increases in the size of the muscle fibers but can also lead to the creation of new muscle fibers themselves. After decades of scientific scrutiny, we now have a basic understanding of the mechanisms occurring. However, like many techniques now backed by research and studies, this practice was first implemented by golden era bodybuilders based solely on their intuition and anecdotal evidence. Arnold Schwarzenegger had a physique far ahead of his time, largely in part to advanced training techniques he implemented based on “feel” and body awareness. One strategy he used is extreme stretching during and after a set. 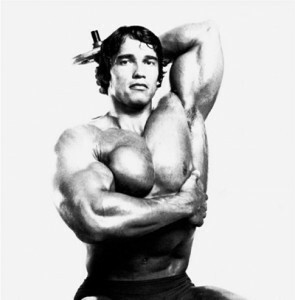 Arnold certainly had a complete physique, but his chest and biceps were his standout bodyparts. While you could chalk it up solely to genetics, it is likely the way he applied extreme stretching to these body parts, in particular, contributed to their development as well. 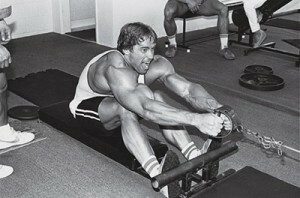 Arnold often spoke of how important it was to get a deep stretch during repetitions. For biceps, he favored incline dumbbell curls which built maximum tension on the stretched bicep muscle. When working his pectorals Arnold employed dumbbell flyes using a much deeper range of motion than was common. He wrote about how important it was to inhale, expand the ribcage, and get as deep a stretch as possible to fully develop and define the muscle. He performed weighted stretches to increase the “pump” and help shape the muscle. Arnold didn’t know exactly why it worked, he just knew he looked better implementing this stretching strategy. 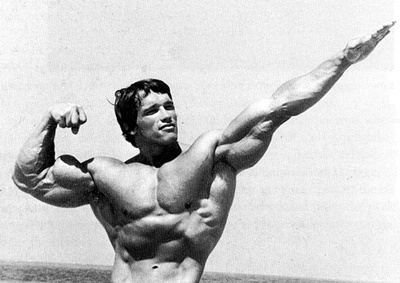 In reality, Arnold was reaping the benefits of stretch-induced muscle growth. While everyone knows lifting weights builds muscles, many are unaware that stretching can produce hypertrophy as well. Stretching increases intracellular pressure by placing tension on the muscle and delivering blood to the area. This swells the cells making the cell wall thinner resulting in instability. Protein synthesis occurs to thicken the cell wall. IGF-1 also increases while intracellular signaling triggers many similar responses that occur during weight lifting, particularly during the negative portion of the lift. This all leads to the stimulation of hypertrophy. When stretching is taken a step further by the advanced trainee, hyperplasia can occur. This creates new muscle fibers through satellite signaling occurring when a muscle is injured, deeply stretched, or worked to an extreme exhaustion. These satellite cells are responsible for muscle regeneration. They create immature muscle cells that bind to existing fibers making them larger (hypertrophy) or they fuse together leading to the creation of new fibers (hyperplasia). In addition to building muscle, extreme stretching can also lead to better muscular contractions and separation. This occurs by making the tough connective sheath encapsulating all of our muscle tissue more malleable. When this sheath is tight, it restricts the range of motion and contraction that occurs during exercise. This tightly binds muscles together, even with other adjacent muscle groups. Leading to a lack of detail and separation between muscles. When this connective tissue is more pliable, the muscles have room to contract and grow. Muscle fullness and separation are also more visible when the sheath is spread evenly throughout the body and not in tight bunches. This is a practice bodybuilders have used for decades to get stage ready. The idea that you could actually increase muscularity through stretching became more interesting to bodybuilders after a 1973 study involving quails. Yes, quails. A weight equal to about 10% of body weight was added to one wing in order to induce a stretch in it’s back muscles. They left the weight on for 24 hours before resting the quail’s wing two days. This went on for a month and, as expected, the results showed an increase in the size of individual muscle fibers of the stretched muscles. In addition to this finding, there was an unexpected increase in the number of total muscle fibers. (1) Numerous similar studies have been done since including one resulting in a 172% increase in muscle mass with over a 50% increase in total muscle fibers. (2) For this particular study, the bird kept the weight attached for 30 straight days with no rest. The largest increase in muscle size and fiber numbers came from a study implementing a progressive overload model where weight increased gradually from 10% of body weight up to 35% of body weight. This resulted in a muscle mass increase of 334% with 82% more total muscle fibers. (3) Pretty impressive numbers, but perhaps you’re wondering how some swole quails with weights tied to their wings relates to your bodybuilding endeavors. Luckily there have been some recent human studies as well, and while we certainly can’t strap weight to our limbs for days at a time, we can apply these principles in the gym and achieve similar benefits. Set up a low incline and let the dumbbells hang by your side. Select a weight you can do for 6-10 repetitions. Bring your elbows behind your shoulders and let your arm fully extend straight down. Flex your triceps at the bottom to get the deepest stretch possible on the biceps. The best stretch for your triceps is the bottom portion of a single arm dumbbell french press. This is best done seated with some back support. Select a weight you could french press one handed for 12-15 reps. Make sure your elbow doesn’t flare out to the side, you can even use your other hand to help pull it in a little to keep maximum tension on the triceps. Since this is done one arm at a time make sure to do a single arm triceps exercise immediately prior. Find a Smith machine or squat rack and set the bar about chest height. With your back to the rack, grab the bar with an underhand grip with your hands shoulder width or narrower. Roll your shoulders forward while bringing the shoulder blades together. Walk out until you feel a nice stretch. You can raise the bar or squat down to increase the intensity. Grab a pair of dumbbells you can perform 10-15 repetitions of chest flyes with. Keeping your elbows slightly bent lower the dumbbells into the bottom of the eccentric portion of the lift. Focus on expanding the chest and ribcage while lowering the elbows as close to the ground as possible. This is most effective if done with the assistance of a squat rack or Smith machine. Simply sit on your heels and lean back as much as possible. Make sure your core is engaged, so your spine doesn’t hyperextend and take tension off the quads. Hold the bottom portion of a Romanian deadlift with dumbbells. Select a weight where you could perform 8-12 reps. Actively drive your hips back and focus on engaging your core while keeping the spine neutral to force the tension on the hamstrings. For calves, we are going to switch things. After you have completed your last set of calf raises, you will do one more set implementing an extreme stretch on every single rep. Select a weight you can perform 15+ reps relatively easily. Make sure this is done using a machine where your legs are straight and not bent at the knee. Perform the concentric portion of the lift explosively. Slowly lower yourself through the eccentric portion taking 5 seconds to reach the bottom. Hold the bottom portion where the stretch is the deepest for 15 seconds before going back to the concentric. Remember we are on our feet throughout the day so these muscles are stubborn and can handle more load. Do this for 10-15 agonizing repetitions, dropping weight mid-set if necessary. Select a weight you can do pullups with for 8-12 repetitions. Note, that may only be your body weight. Simply hang from a pullup bar letting your arms stretch out as much as possible with your feet off the floor. Go for a wide grip and use lifting straps if your grip is not strong enough to hold for the minimum 30 seconds. This stretch targets all the muscles of the back with the main emphasis on the rhomboids and low traps, which contribute to thickness in the upper back. Set up on a low cable row using a handle with a narrow grip. Let your upper back round while keeping the lower back in a neutral position. Think about pulling your shoulder blades as far apart from each other as possible. Use a weight you can complete 6-10 rows. To stretch the upper traps simply grab a pair of dumbbells and let them hang by your side. Make sure they don’t rest against you and imagine you are actively reaching down towards the ground. It should hurt. Your body will try to compensate to alleviate tension on the stretched muscle. Make sure your spine is neutral, and you are not “shifting” or taking tension away from the stretch. If the stretch isn’t so deep you want to quit after 20 seconds then it's not deep enough. It shouldn’t injure you. Although it should be plenty painful, maybe even borderline unbearable, it shouldn’t cause an injury or hurt after you have finished stretching. You should feel pain in the targeted muscle, not in joints or ligaments or muscles not associated with the stretch. If something feels sketchy to you, then stop immediately. Also, always make sure to do these extreme stretching techniques at the end of a workout when the muscle is loose and warm. Proper supplementation can help. These stretches tear apart muscle tissue like no other bodybuilding technique, so you want every advantage possible when it comes to recovery. Supplements like Sheer Recovery And BCAA’s help speed up the recovery process. They contain essential amino acids for protein synthesis and other nutrients that will reduce soreness and accelerate muscle growth. Supplements mean little if your diet is off so be sure to eat a healthy diet - high in protein and nutritious whole foods. Follow the progressive overload principle. Every two weeks make sure to progress the stretch by adding weight where possible. Although weight is the ideal way to progress you can also hold the stretch longer. For stretches not using weights, such as the shoulder and quad stretches, focus on getting a deeper range of motion to get a more intense stretch.